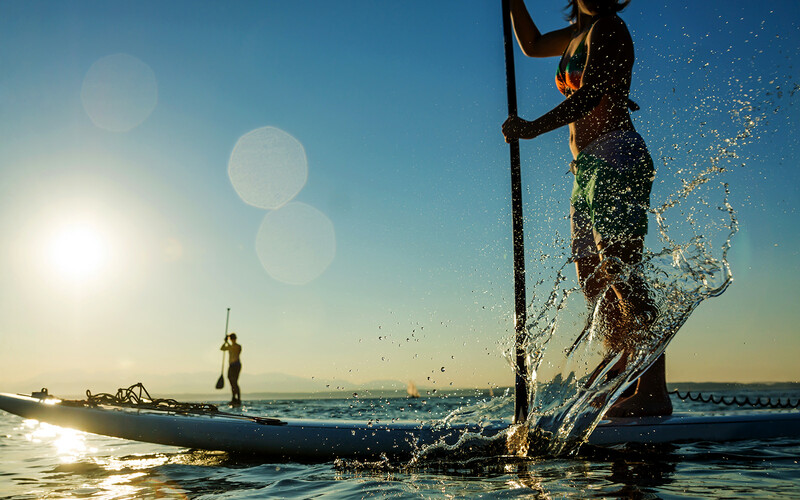 Stand up Paddleboarding is the fastest growing sport in the Florida Keys. It’s easy and a lot of fun. Most people can jump on a board without any lessons. Couples, individuals, and families with kids will enjoy exploring our beautiful marine environment. Marathon’s clear waters are perfect for your paddleboarding experience. You’ll be able to enjoy your board standing, sitting, or laying down. It’s an inexpensive and healthy way to experience the outdoors. Cruise along independently and discover colorful fish, beautiful corals and more! Our Bayside location in Marathon is ideal for paddleboarding because the water is calmer than on the Oceanside. We are protected by the island chain and the shallow depth of Florida Bay, which make for smoother waters. Our convenient Middle Keys location means you’ll be paddling in no time. Compared to paddleboarding in Key West or Key Largo, your experience here will be more peaceful and secluded. Our warm waters provide unique wildlife viewing opportunities. It’s not unusual to see endangered manatees or dolphins passing by, which will make for an unforgettable adventure! While paddling along the shoreline, watch for tropical fish in the roots of our mangrove trees. In shallow areas, look for rays, lobster, nurse sharks, and sea turtles. Standing on your paddleboard gives you a birds-eye view into the clear water. As you paddle quietly, you can blend with your marine environment without scaring wildlife away. We invite you to book one of our stand-up paddleboard rentals today and enjoy a memorable paddling adventure along the Keys’ beautiful shoreline!